Today I photographed an event at one of the West Philadelphia libraries and I heard songwriter & record producer Keith Pelzer say the wisest thing I've heard in a long time ... which was "Do not confuse success with significance." That's the warning label I want to see on every issue of People magazine. 2013 actually started off really well.Going forward, it would do me well to remember that the beginnings were good.Before the ice cracking and creaking, before sicknesses, community strife,debts & deaths. It began with snow and a party, at the soup battle. it was a centered and grounded way to start the year. and hugs with the Tuggles (which is how my year will kick off next week). I had my first experience as a TD with Women of the World Poetry Slam. I was new, nervous, and although there is still so much to learn--I think Seth & I make a good team.There were a couple of incidents and in them, I felt good for the role I had.Everyone put on a great show.Hanging out with Jazz,Theresa, Nathan, Vernell seeing Shyla in her first nationals-level event---the whole thing was a growing experience. Taking pictures for Adam was fun, too.It's undoubtedly my favorite big poetry event. Working in service to it is humbling. NYC with a wonderful college poets and simply amazing, elevated words of art.Witnessing students take in Patricia Smith live and their inspired reactions. Working on updating my resume and cover letter materials, I started applying for different jobs in earnest.Noting that I started my current job around the week of my birthday,I thought it was fortuitous to find one at about that time that really matched what I could offer.The process took five months, between necessary pieces of paperwork, waiting in between, interviews, the unofficial offer, the official offer, etc.It was a bit absurd, actually, but it updated for me what the job market is like now (college transcripts, a longer cue of supervisors and references, a writing sample in addition to resume and cover letter,copies of licenses). I really should re-focus and remember that I set a life-altering goal and I met it.With flying colors, I met it. This should also mean that if I set goals around other things,even in other states, I should definitely be able to set my mind and course on them.There is no reward without risk. Living with Theresa, especially now, while she is on the rise.Her success is a familial one.This was her first full year of touring and living as a working artist. And she did it! And puts food in our mouths (often,breakfast, bacon & soup! )We've been through so much. Hanging out with Adam R., who says things and answers questions I didn't know I had.I am not sure how he does that, but we are on some kind of similar frequency when we're around each other. Crying on the Cuffees. Crying with Adam R.That part of the world is always a highlight.So many favorite humans & writers out there.It will still be there on the map. Spokane Washington, the metal goat, Garrett Potter & IWPS, Xero winning. Kissing, hugging and floating with Canadians. Hanging out with New England poets. Bill's visit, Adam S.'s visit, visiting Ryk. Swimming in a pool half naked in December. Meeting Doomsday & hearing new pieces from Daphne. The poems, Cliterati,my poetry team---always my poetry team & Atlanta poets, Charis Books & More. Poetry is good. All the time. "You have to participate relentlessly in the manifestation of your own blessings," says author Elizabeth Gilbert. I recommend that you experiment with this subversive idea, Aries. Just for a week, see what happens if you devote yourself to making yourself feel really good. I mean risk going to extremes as you pursue happiness with focused zeal. Try this: Draw up a list of experiences that you know will give you intense pleasure, and indulge in them all without apology. And please don't fret about the possible consequences of getting crazed with joy. Be assured that the cosmos is providing you with more slack than usual. we had a beautiful poetry party outside last night. blankets, bottles of wine, cheese, grapes,snacks, tiki torches. the location is an art house, a beautiful old one in candler park. the kitchen would be perfect for a kitchen sessions poetry thing. the fireplaces are old with original tile,there's a revolutionary resource office, an art studio & a meeting room perfect for yoga. the back deck and yard are huge and the screened in front porch cozy. i only found out about this house a couple of months ago, which is a shame because now they're worried about losing the space to higher property taxes/rent. the landlord bought it to be saved from demolition into a mcmansion & offered a year of free rent in exchange for fixing it up. so many things could happen there, like last night. we generated a bunch of ideas. my team mate, is quitting her massage job because hse' struggling to commute an hour or more to it every day and she wants an in-between place to set up. perfect. ken j. wants a community space for guitar lessons. perfect. i am really freaking out about work stuff, mainly because i've coasted for so long without having to think about it.that's been bad in terms of not really going forward with my own skills and education, although i am being hard on myself---i show up to a lot of poetry, after all.last night had me thinking about portable skills, too.if i were to offer writing workshops, what would they look like? it would be great fun to put them together.what if i had a grief counseling something or other? i've really been interested in that area because so much of our rawness and what it means to live comes out in that process and so many unique and sharp reactions occur in that space. i am trying to reframe the panic and anxiety of the last few days as part of an overall realization and struggle for change that i've already been pushing myself toward, with positive result. it hurts less in a house crawling with artists. yesterday. My skin is still burning. And sad. I am still a bit in shock. realize how it would feel in the moment. or find something generally less stressful for awhile. & looking at school again. You can tune in for updates, sports podcast style! you reach out and the person lies and tells you all that was written in a fit. you don't make it in time. everyone knows they weren't finished. and this person tried hard to finish on purpose. scrapes at you with tattoo needle. the shell that wouldn't let go of the soft clam insides. one with you in it just a little. depression and addiction are such beasts.rampant in the artists. pit behind the teeth, the breath bad,the possibility of bite. I am lucky enough to have a friend who I see rarely, however, whenever we hang out, I feel like we catch up with where we left off and pack a condensed amount of connection into whatever short space of time we're hanging out.She and her music have had a profound effect on my life. We've collaborated. She's the only person I know whose lyric I I feel okay about having tattooed on my body. We've also shared deep sorrow and pain (from Katrina to going to take care of Shannon's dog the day she passed). She's one of the few people who has heard me actually keening.We have also made great toasts of winning and congratulations together. I've been feeling these last few days as though I just can't decide on my own life.I want both things, which are a geographic impossibility.I feel like everyone is cheering me on, to go for it, to move, but I am still, I am ambivalent. I thought I would get a reading meeting my potential co-workers that would sway me one way or the other. I was surprised when that didn't shift my ambivalence. Physically, my gut is sick and my arms are hot.The last time I felt this way was not good, so the association is more like alarm/self-defense to me than excitement/yayness and that's confusing, unexpected, not helpful. My friend just made her own path altering decision.She knew I had this coming up & so we talked about how we still have so much to prove to ourselves, to invest in ourselves, to grow & that sometimes you think you want one thing, push yourself toward it & it leads to some other realization, underneath it all.Maybe it was in your periphery or you've been hiding from it, or you knew it was there but elaborately scheme and dress it up so you don't have to face it as directly.We put everyone else between ourselves & the mirror.We are both really good at doing this. Even though we don't see each other as often as we like, I always know she has my back. We bought malty beverages and cheered to each other, laughing. This all happened at the Girls Rock Camp ATL show.The 6th one (WOW, already!). This time, 3 of the girls "graduated" from the first years of volunteering, from scrawny youth to almost-college.What an amazing thing to witness.Because the director is good like that, I got a founder's shout out.I will always be more proud of this than almost anything else---that a conversation I initiated with "hey, you did your thesis on girls rock camps. this other musician wants to launch one. i think you'd better beat her to it," has become her job, this beautiful event that's so much bigger than any of us who were there putting in the foundation, how many little pieces have expanded this since then.there are more bands, volunteers & donations than ever & it's become more sustainable than those first years seemed possible. Anyway, my friend always seems to show up at critical points~close in a particularly soulful way. I think I know a little better, stronger, what I've been doing and what I need to do. Current Music:the new band "Where the Other Sock Went"
The blue & the sharpness in this photo is exaggerated, but this is a new favorite spot. 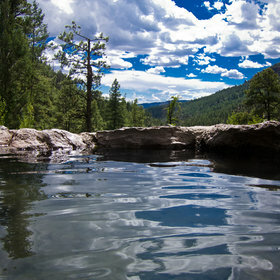 Jemez,NM, hot springs.You can float on your belly here, arms stretched out & it feels maybe a little bit like flying through the ridge.I did this on Father's Day (Hi, Dad! ),making me very much my father's daughter. The drive out was stunning, amazing & Adam said "one of the first things I learned about New Mexico is that it is anything but treeless," and with that, we went into the forest. Along the way were bright greens, red rock, dark greens & cathedral-like formations. On the way back to Georgia, my layover went in the wrong direction, to Las Vegas, but it was fine.So much deceptively boring earth below, so much dryness and dirt, and then again, trees and weird, gummy red stitches, yellows, oranges and viola! The Grand Canyon! (or at least,an edge of it, then stretching out into what looked like forever. Mixed feelings about the job face-to-face part. I thought I would feel more definitively about it after meeting my interviewers. I still have questions, but ones that are still not right until there's an offer. So we'll see. But I crossed that bridge, am crossing bridges. Now I wait another week, on UNM HR and think things over.My heart says "what's to think over?" remembering the landscape, my sweet friends,everything.Life changes aren't easy, though.How fortunate to feel like one has more than one home. Looking forward to meditation later this afternoon. today's a good day for b-days!